A pair of old friends share a mid-life crisis. In this era of toyshops that open at a way-past-bedtime midnight to sell Star Wars toys to old men, and casting decisions made by Marvel studios which are automatically subject to cries of betrayal and entitlement from lifelong fans, A Legacy of Whining seemed pertinent to me. 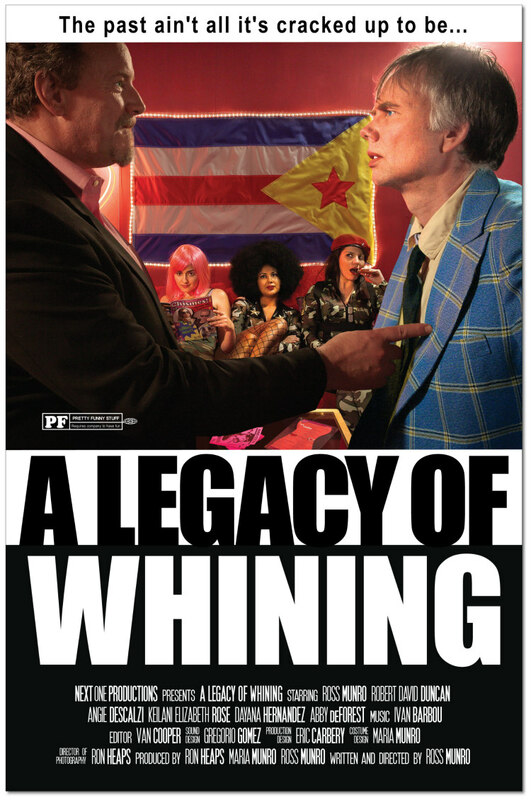 Like a serious book, actor/writer/producer Ross Munro’s mid-life crisis comedy, A Legacy of Whining, is prefaced with a literary quote: ‘One is always at home in one’s past’ (taken from the appositely dirtiest of dirty old men, Nabakov). During the first 10 minutes of the film, the citation seems incongruously lofty when placed within the knockabout comedy context of the action. We see a lone guy at the airport, Mitch (Munro), and meet the various picaresque characters that he encounters; a wheelchair bound prostitute, and a gaggle of selfie posing pornographic actresses. But, in fact, as the film finds its grim, captivating rhythm, it is the initial wackiness of A Legacy of Whining that is discordant, as if the film is marking its theme of confounded expectations, developing into the sort of nuanced, unflinching discussion of male arrested development that Nabakov, the Laurette of such matters, would be proud of. Middle aged Mitch is at the airport to meet his childhood pal Dunc (Robert David Duncan), a school friend he hasn’t seen for three decades. The pair don’t seem to have spoken for all this time, and so we learn by proxy exposition that in the interim, Dunc’s marriage has dissolved and he’s now a leery old lech chasing college girls, and sad sack Mitch dreams of being an actor in the style of ‘Dusty Hoffman’. Mitch and Dunc haven’t even corresponded for 30 years, which begs the question: why are they bothering to meet up at all? The unvarnished answer is that neither of them have anything else going on. With Mitch hopelessly attempting to hold on to his glory years of high school, and Dunc kidding himself with embroidered tales of his sexual prowess, it appears that this, tragically, is it. Old age is lonely and ornery. But A Legacy of Whining goes much further than this typical plot dynamic. Unlike, say, the man childs of the Hangover movies, Mitch’s supposedly glory days of youth were never that: when most kids were out doing typical teen things, these two were driving about egging people. It’s not only Mitch’s present that is tragic, his past, a bank of fun memories he draws from, is also ruined throughout the film, as Dunc stamps on Mitch’s rose tinted specs; ‘we were beyond depressing, Mitch’. Mitch tries to ‘recreate the old magic’, but discovers that there is no magic to rejuvenate. And so, instead, the two drift about the city, driving, failing to pick up women, and bemoaning the state of the modern world. Most ‘old geezer’ films focus on the changes that people undergo as they get older, but A Legacy of Whining is more concerned with maturity’s saddest and most frustrating reality; it isn’t the person that changes, but the world around them which transforms, and renders them irrelevant. Amusing as it is, this is comedy more bitter than sweet; but don’t get it twisted, A Legacy of Whining is really funny, with Mitch and Dunc’s grievances manifesting in several amusing diatribes - there’s a good one about the hipsterfication of coffee shops, and the other a little dig at ageing punks who inevitably sell out (‘I think he’s called Sir Johnny Snotnose now’). These are pretty typical grievances, for sure, but A Legacy of Whining’s light touch on such matters is winning. There’s a final act swerve into more zaniness, detailing an encounter with a Coen brothers-esque all female revolutionary gang, but generally A Legacy of Whining saves its coruscating focus for a particularly male type of infantilism and inability to move on. As I watched, I felt a curious niggle; the film is an indie flick with rough edges, but it certainly had enough to get under my skin. In this era of toyshops that open at a way-past-bedtime midnight to sell Star Wars toys to old men, and casting decisions made by Marvel studios which are automatically subject to cries of betrayal and entitlement from lifelong fans, A Legacy of Whining seemed pertinent to me. Perhaps that niggle was the discomfit of an inconvenient truth.